Villa CAVE, one of our most special …spots. 45 square meters large, built literally in the sun-carved rock that some … ancient god has left here to remind us of the founding stones of the magnificent Cyclades. This picturesque villa can accommodate 2 plus one persons (1 bedroom and a single bed in the living room) and offers all the amenities you need combined with two large patios and a beautiful garden. With a view able to unlock the secrets of the horizons, with the power of the earth and the timeless charm of the sea in pure harmony, there will be moments when you will feel that you completely belong here. Staying in Villa CAVE, every day will have the feeling of being in the most beautiful place in the world. Transport to and from the port or the airport. PARADISE MADE JUST FOR YOU Villa Paradise is the seaside heaven you have been dreaming of. Located at the Plaka beach, it is the harmonious combination of the enchanting sea, the fertile land, the mysterious rock and the endless sky. The spaces, the images and the sublime beauty of the Naxian landscape make Villa Paradise the ultimate place for ideal holidays and an unforgettable stay. PLAKA - NAXOS Luxurious villas with a unique style, environment friendly in complete harmony with the unravelled island philosophy, equipped with everything you may need for a comfortable and relaxing stay, the Villa Paradise complex is definitely a heaven created just for you in our wonderful island, Naxos! The experience of your stay here will never be forgotten. We are certain that Villa Paradise will be the most beautiful place you have ever stayed in! 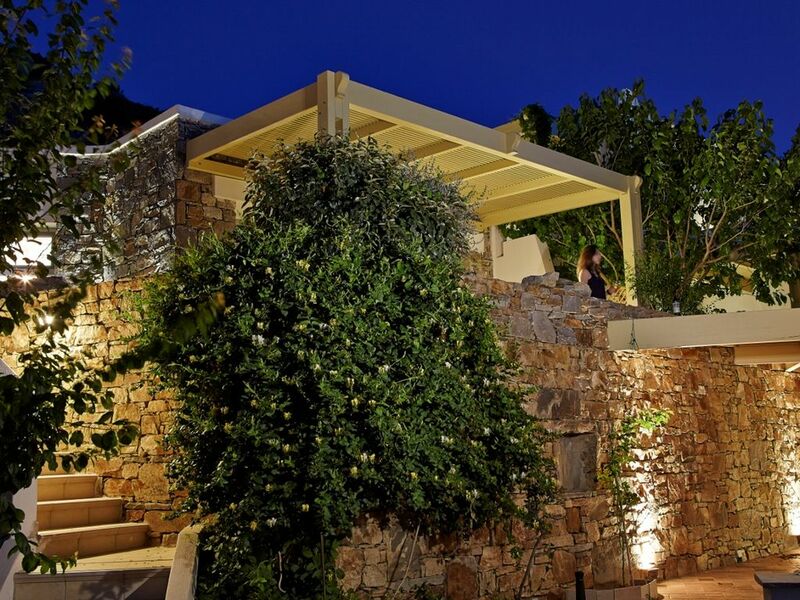 It is part of the boutique villas hotel - Villa Paradise- and located right on the sandy Plaka beach where you offer you private beach umbrellas with sunbeds. The complex offers stunning view at Aegean sea , at the amazing Plaka beach as well as to the sunset. we offer you vegetables and fruits from our garden. There is reception from 8:00 until 24:00 and you serve you with breakfast , lunch or dining on request. The Villas are brand new , clean and private. We have laundry service and daily maid service. The location is the perfect starting point to explore Naxos as well it offers quite calm and spectacular sea view. Villa Paradise is a small village with 10 private villas on the beach , all are unique and different each other. This is the Boutique Villas Hotel - Villa Paradise in Naxos island. In price are included : • Taxes & services. • Daily maid service. • Private sun loungers with umbrella at the beach. • Wi-Fi internet. • Vegetables & fruits produced in Orchard Paradise. • Private parking area. • Barbeque equipment. • Welcome basket. Our vegetable garden Welcome to the vegetable garden of Villa Paradise. We have created a verdant 3,000 square metres stretch of land for you to enjoy fresh local fruits and vegetables taken directly from Mother Earth. Here, you will have the daily opportunity not only to acquire, but also to observe or even participate in the process of cultivation and production of the excellent fresh fruit that the Naxian earth has to offer. The beach Paradise The Villa Paradise located right on the sandy beach where you we put exotic umbrellas with sun beds only for the hotel visitors. The place is quite and the views to the long Plaka beach are always amazing. The sun beds are enough for such guest ,a beach shower is placed in a good point and beach towels are available Services & Amenities : • Privacy. • Tour information. • Reception service. • Television satellite, DVD. • Fully equipped kitchenette. • Full air condition. • Bath amenities / iron / hairdryer. • Garden relaxing chairs. • Outdoor dining. • Credit card payments. • Baby cot & high chair. Upon Request Port/airport transfer (20 euro) Naxian Breakfast upon request. (10 euro per adult , 7 euro per child) Personal Chef. (60 euro per time) Baby sitting. (10 euro / hour) Laundry service. (8 euro / bag) Car & bike rental. Sailing or inflatable rental. Massage service inside your villa. Bicycle rental. Discount offers for kite surf lessons&equipment at Mikri Vigla . (-20%) Fresh fishes from Aegean sea. Dining or Launch at Garden Paradise. Our vegetable garden Welcome to the vegetable garden of Villa Paradise. We have created a verdant 3,000 square metres stretch of land for you to enjoy fresh local fruits and vegetables taken directly from Mother Earth. Here, you will have the daily opportunity not only to acquire, but also to observe or even participate in the process of cultivation and production of the excellent fresh fruit that the Naxian earth has to offer. Thus, you are able to combine your stay with a healthy lifestyle, enjoying at the same time the direct supply of our products, at no extra charge. We have invested much care and love in our vegetable garden. It is located right next to the beach and is surrounded and protected by trees, creating a landscape of outstanding beauty and vegetation.